While browsing server logs, I kept seeing these super long request URIs that begin with “YesThisIsAReallyLongRequest…” and then the request string just keeps going for like 1 kilobyte worth of characters. Not just a few times, but many. In other words, somebody is going around and repeatedly hitting servers with gigantic-size requests. Probably to test server response using other people’s servers. Ummm, yeah kinda malicious. So I did some research and then blocked the “ReallyLongRequest” Bandit. While investigating my Apache server logs, I discovered hundreds if not thousands of these “really long” requests going back many months. So for who knows how long, these clowns have been hitting who knows how many sites with giant-size requests. How giant? Whatever it takes to crash your server? Maybe probing for vulnerabilities? At this point, all we know for sure is that someone is going around wasting server resources like a total bandit. To learn more, let’s dig a little deeper.. Yes, this is a really long request URL, but we are doing it on purpose. We are scanning for research purpose. Please have a look at the user agent. Thanks. These connections are part of an Internet-wide research study being conducted by computer scientists at RWTH Aachen University. The research involves making benign connection attempts to every public IP address. By measuring the entire public address space, we are able to analyze global patterns and trends in protocol deployment and security. As part of this study, every public IP address receives a handful of packets per day on a selection of common ports. These consist of regular UDP probes and TCP connection attempts followed by RFC-compliant protocol handshakes with responsive hosts. We never attempt to exploit security problems, guess passwords, or change device configuration. We only receive data that is publicly visible to anyone who connects to a particular address and port. The data collected through these connections helps computer scientists study the deployment and configuration of network protocols and security technologies. For example, we use it to help web browser makers and other software developers understand the impact of proposed protocol changes and security improvements. In some cases, we are able to detect vulnerable systems and report the problems to the system operators. Can I request that my server be excluded? 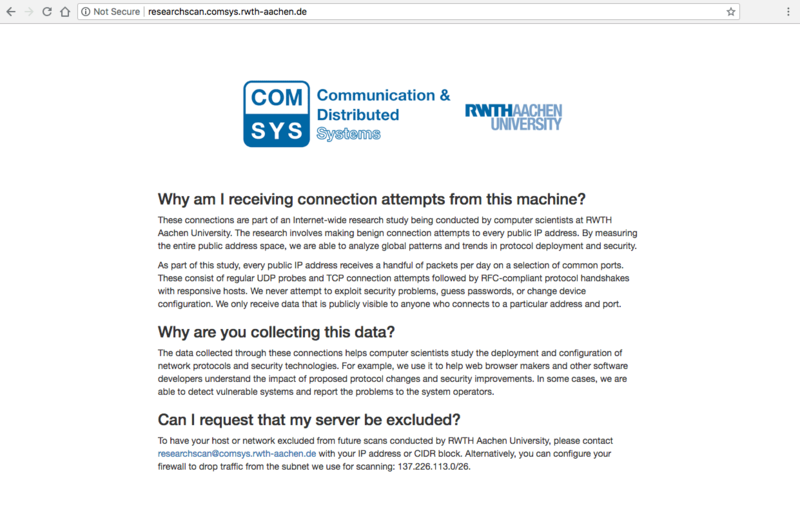 To have your host or network excluded from future scans conducted by RWTH Aachen University, please contact researchscan@comsys.rwth-aachen.de with your IP address or CIDR block. Alternatively, you can configure your firewall to drop traffic from the subnet we use for scanning: 137.226.113.0/26. Ahhh, so that’s what they’re doing with the endless really long requests. Of course, it’s up to you to believe or not believe whatever you read on the Internet. Personally, when it comes to security, I tend to be a little cynical. Not that I don’t think these guys are legit; it’s just that I don’t want people running malicious tests on my server. I work too hard to “trust” blindly just because some web page says so. Instead, I examine the facts and draw my conclusions after applying critical thinking skills and a healthy dose of wisdom. You make your own decision, but in my experience this behavior is a nuisance, unethical, and in fact malicious. Simply claiming “we are doing research” does NOT give you carte blanche powers to act unethically and leech precious resources from millions of servers for years at a time. Before I digress into a lengthy diatribe on ethical hacking, it’s time to put an end to this nonsense..
For those that want to block the long-request bandit, there are several ways to go about it. Here are three ways to make it happen.. This blocks the bandit’s entire IP range. If we perform a quick whois lookup, we can verify that 137.226.113.7 is on the network belonging to RWTH Aachen University in Germany. So save the changes, upload to your server, and done. Using two directives with different matching patterns is a little redundant, but it ensures that any variations of the ReallyLongRequestURL will be denied access. This method does not block query-string matches though, so for that we can use mod_rewrite..
That’s gonna do the job just fine. But if you have to choose one of these three methods, go with the first and just block the entire range of bandit IP addresses. The alternate methods are just for your information, and/or just in case blocking via IP is not possible in your environment. Also, you may want to check out more ways to block stuff with mod_rewrite. Just replace example.com with your actual URL.